Twitter announced a few minor updates to its search product on mobile Wednesday, highlighting a few changes intended to get users taking greater advantage of search and using the different tabs to find new content through the app. 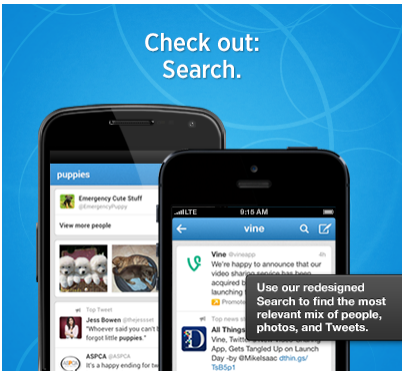 The changes apply to Android and iOS versions of Twitter as well as the mobile browser version. The updates include a change to the discover tab, which will now include suggestions for both users and tweets all at once; search results that show all content in one stream rather than dividing up by users and tweets; and a tweaked connect tab that now defaults to all interactions rather than just mentions. The full explanation of the changes are available in Twitter’s blog post updated on Wednesday morning. Getting users to take advantage of the discover tab has been an ongoing goal for Twitter, as is improving its search function, which has undergone significant changes to become what it is today. The content created by Twitter users is ideal for building a useful search engine, much as Facebook wants to do, and the company has been moving in that direction this year.